Heart's Delight Cards: This Year is Starting off With a Bang! Okay, I'm not one who would normally toot her own horn...oh, who are we kidding, I TRY not to toot it too much, okay? Anyhoo, I received the most amazing email this morning from Kellene Adams, who works in Shelli Gardner's (founder and CEO) office at Stampin' Up! (can you say "dream job"?). She wanted to let me know that my entry was a winner in Shelli's Terrific Techniques Challenge (one of the monthly So Shelli challenges). I was flabbergasted, to say the least! If you could see the quantity and quality of the entries that get submitted every month, you'd understand why it is such an honor to be one of the ones chosen. This is the card that won. Thank you, Shelli, for making my day, and Kellene for letting me know!!! This challenge open to anyone, not just Stampin' Up! demonstrators, and the entries don't necessarily have to be cards. Just stick to the theme Shelli gives each month, and maybe you can win, too! The prize is any stamp set out if the current catalogs. Yep, even the pricier ones! So, winning the So Shelli contest today is just continuing a month that started out great by Mickey Roberts (Paper Conversation), a "sister" SU demonstrator, awarding me a Stylish Blogger Award. Thanks, Mickey! Sorry it took so long for me to acknowledge & pass it on. Been busy! 1. I used to be the owner/designer of my own line of bra patterns, and had a home-based mail order sewing supplies business. 2. I am a published author (in a couple of magazines, anyway). 4. I spend way too much time on the computer, looking at other people's blogs for inspiration, checking in at Stampin' Addicts and Splitcoast Stampers, playing Free Cell, and on Facebook. I could get so much more done if I could just pull myself away! 6. I love to garden, even though I only have a very small space to "grub in the dirt". Nothing tastes better than a fully ripened home grown tomato, still warm from the sun! 7. I love horses. Always have, always will. 8. I love being a Stampin' Up! Independent Demonstrator! Sharing the fun of making something beautiful with people who never thought they could do it, gives me so much joy. And just think about how much happiness one little card can give! There's the pleasure you get from making it, the happiness you feel when you see how much the recipient enjoys it, and the joy that THEY get in receiving it! That's a lot of happiness in one little card! Congrats! What a fun phone call to receive! Congratulations on your win. Love the card and I can easily see why it was a winner. That is the one fold I can do. I'm folding challenged among a few others. LOL. Thank you for the lovely award. Made my morning. Congratulations on winning! It is a well-deserved honor! Cindy congratulations on your win! Well deserved too. The card is stunning, so go ahead and TOOT that horn! Congratulations Cindy!! What an honor to have your card chosen by Shelli!! That card is gorgeous. It deserves to win. I loved reading more about you. Really, a bra maker? Never knew there was such a profession. I thought everyone just went to JC Penny for those things. 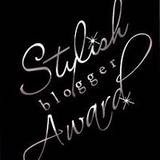 Thanks for the blog award!! I'm so honored. You are the sweetest. Congratulations on your So Shelli challenge win Cindy - how cool! It is a great card. Thanks so much for the blog award. I was really shocked, but chuffed. Congratulations!!! It is such an honor to be chosen as a winner of Shelli's challenges. Of course you should be bragging. I sure did when I won. Congrats on your selection! Woohoo! AND new stamps! Doesn't get much better than that!!! Congratulations!! What an honor, and what a great card! That tree is beautiful! !